By guest blogger Joe Lamp’l, executive producer and host of Growing a Greener World, a new public-television series that delivers to a modern audience the latest trends in ecofriendly living, mixed with traditional gardening know-how. It ended way too soon; some of the most important chapters of my life were over and I just wasn’t ready. I wanted more. They say you should never look back. Don’t live in the past; you know, whatever it takes to get through the moment and move on. But this time I couldn’t help myself. Her words captivated me from the beginning. I still had the power to go back, and that’s exactly what I did. At that moment, I decided to start all over again, and it was just as good as the first time. 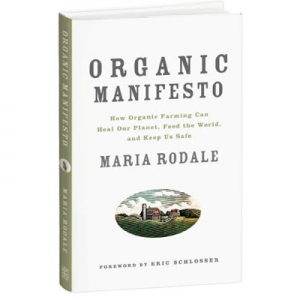 Organic Manifesto, by Maria Rodale—one of the most important and impactful books I’ve ever read. Until now, there were only two books that had had that kind of impact on my life: An Inconvenient Truth by Al Gore, and Rachel Carson’s Silent Spring. Now there are three. Why did this book make such an impression on me? I read a lot. I’m not much on novels (no time), choosing instead to read more reality-based, industry-related, self-improvement books (always time for that). Recently, I sat in my airplane seat, totally satisfied and, oblivious to the usual distractions, contemplating why this book was so compelling. Hollywood producers take note: This book was a combination of a reality-based suspense thriller, mystery, and big-business/political exposé, with a hearty portion of modern-day David and Goliath, all wrapped up with a closing dose of empowerment and hope. Wow! I’ve had a chance now to spend time with Maria on a couple of occasions, for the television show that I host and produce for national public television and also for my online radio show—both with the same name, Growing a Greener World. 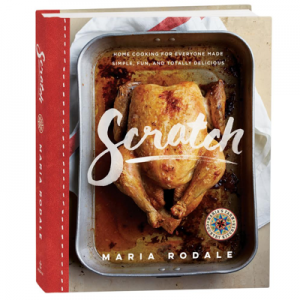 It’s no surprise that Maria, as a third-generation Rodale, feels so fervent about what’s happening today. On one hand, we’re losing ground to the colossal chemical companies and government that have lost sight of our interest. And on the other, our interests still have the power to evoke significant change. In my discussions with Maria, and no doubt with any opportunity she’s given, that passion and frustration and call to action all come pouring out if you just get her started. She’s real! I saw it in her face and heard it in her spoken words, and you feel it in her book. Organic Manifesto takes on issues that affect our lives every day, issues that are literally life threatening to our health and that of our planet. No matter how deeply we bury our heads in the sand, her commonsense candor, combined with real-life, jaw-dropping facts, causes us to finally stop and ask ourselves: How and why is this happening? Every dollar we spend sends a message. We can vote with our dollars by choosing to support the companies that are killing us and the planet, or we can say enough already and finally start turning the tide on what we buy and how it’s made and grown! Fortunately, Maria gives us a very simple solution: Demand organic! It really is that simple, if we all work together. An organic manifesto really does have the power to change the world, and now is the time. See Maria Rodale and the Rodale Institute on Growing a Greener World with Joe this month. Use this link to see when the show will be aired in your area: pbs.org/stationfinder/stationfinder_relocalize.html. Every station is different in its lineup and broadcast times. WJNSDT, NJN (New Jersey Network) will air the show Saturday, October 16th, at 1:30 p.m. Growing A Greener World: The Rodale Institute! Joe! This is so sweet of you. Reading it for the first time here and I am so honored by your kind words. I hope everyone watches the show because it is so beautifully filmed and they can see what a great guy you are, too! THANK YOU. Can’t wait to read it. I just reserved it last night from my library website. This was a pleasure for me to write. The words come easy when you care about the subject so much. Thank you Maria for the opportunity of guest-hosting your blog. It was an honor. I just finished the book yesterday, and today I want to buy a case of them. I am thinking of giving a copy as a Christmas gift to everyone I know. Excellent book. Everyone should read it.